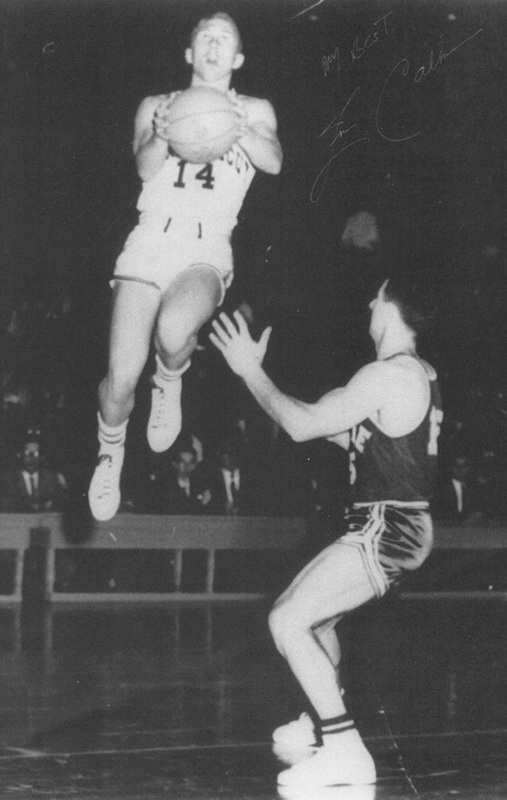 Len Carlson was a Guard for the UConn Huskies from 1959 - 1962. He's a member of the UConn Basketball All Century Ballot, was the team captain, and leading scorer during his junior and senior seasons. I spoke with Lenny in April 2012 from his home in Augusta, Georgia as he reflected on his college and post-collegiate sports career. Lenny summed his career up saying, "My life has been a continuous fast break." As a youngster Lenny loved basketball so much that he slept with a basketball in his bed. He learned to play basketball as an option to go to college. "I was a poor kid, and when I asked my dad if I had any chance of going to college he told me I either had to be the smartest kid in school, or the best basketball player in the city, and I knew I wasn't the first one." Len went to North High School in Worcester, Massachusetts where he was the leading scorer, and made the All City Team for two years. Len's high school coach was his homeroom and math teacher. The gymnasium at school was in a cellar type of area. "I remember going to the gym at 6:30 AM to practice. When the teacher called out my name for attendance he'd bang a broom handle on the floor, and I'd scream up through the air ducts 'here'." Len was a late bloomer physically and planned to go to Worcester Academy Preparatory School for a year to play for head coach Dee Rowe before going to college. During the summer between high school and prep school, Len played in a summer basketball league. He was age 17, playing basketball with guys between 24 - 35. Len was pretty good, and one of Len's teammates on the summer league thought Len was ready to play college basketball. Len's teammate knew Nick Rodis (UConn basketball assistant coach), and invited Nick to see Len play at a summer league game. "Nick Rodis and Hugh Greer (UConn basketball head coach) came to a game to watch me play and that was it. I was offered a scholarship, accepted it, and I was on my way to UConn." When Len told Dee Rowe he decided against going to Worcester Academy, Dee told Len he needed another year before going to college but Len went to UConn anyway. "That was the first biggest mistake of my life." If Len were playing today, with the way kids are red shirted (held back) to get bigger and stronger, he would have been held back a year of high school, and a year of college. "I would have been a 23 year old senior in college instead of a 21 year old senior, and I was twice as good at 23 as I was at 21." The outcome for Len was graduating from UConn as a District All American (top 20 player), and graduating as a National All American (top 5 player). While at UConn Len had a really good freshman year. His sophomore year he was sick with mononucleosis. Len wasn't able to practice or play much. "The second biggest mistake of my basketball career was that I should have red shirted to save a year of eligibility." Len almost quit basketball because he was so weak. "My dad got me a job for the summer at the factory where he worked and told me I'd either come out dead or strong. He was right I came out as strong as a horse." Len entered his junior year at UConn with all of his strength back. "I led the team in scoring my junior and senior years." The game of basketball was played differently when Len played. There was no shot clock, you passed the ball a lot rather than shoot, you weren't allowed to dunk, and there was very little freedom. 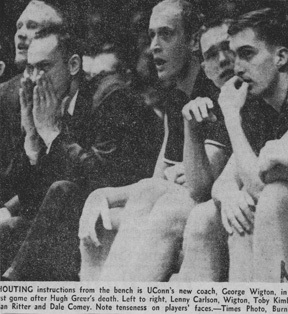 "This past winter I visited George Wigton who was on the UConn coaching staff when I played. He told me I would have been a much better player today than I was then because the coaches were never able to turn me loose to just play." After Len graduated from UConn with a Bachelors Degree in Physical Education, the freshman coaching position was open and offered to Len. 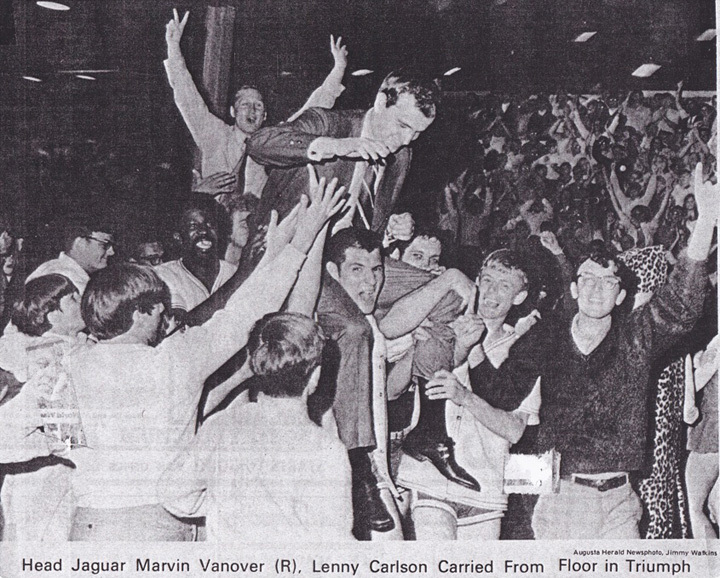 Len didn't remember how well the team had done that year because something much bigger than a basketball game took place. "One day about 12 games into the season, I was shooting baskets in the Field House. Before going home for the day Coach Greer who always called me son, said son I'll see you tomorrow. About 25 minutes later I got a call from J.O. Christian (UConn athletic director) telling me to come back to school with a suit on. I said come on who is this. There was a snow storm going on. J.O. said, Coach Greer is dead. I'll never forget it. I dropped the phone on the floor." Len became the head assistant coach of the varsity team and George was promoted to head coach for the remainder of the season. "We won the Yankee Conference and went to the National Collegiate Athletic Association Tournament but got beat by West Virginia." Len and George were too young for those coaching positions as permanent positions. UConn hired Fred Shabel who was an assistant coach at Duke University to be the head coach at UConn. "Fred asked me if I'd like to stay on the coaching staff but at the time the National Basketball Association (NBA) was expanding to the 9th team, and they were interested in me. I knew I could make more money playing in the NBA than coaching at UConn so I turned Coach Shabel down." The team at the time was the Chicago Zyphers later became the Packers; after the meat packers in the cattle yards. While Len was trying out for Chicago he was notified that he had to go to the Army. Back then it didn't matter who you were, if you were drafted you went. "The best hitter in baseball, Ted Williams had to fly jets in the Korean War. Can you imagine if LeBron James or Kobe Bryant had to go to the armed services?" 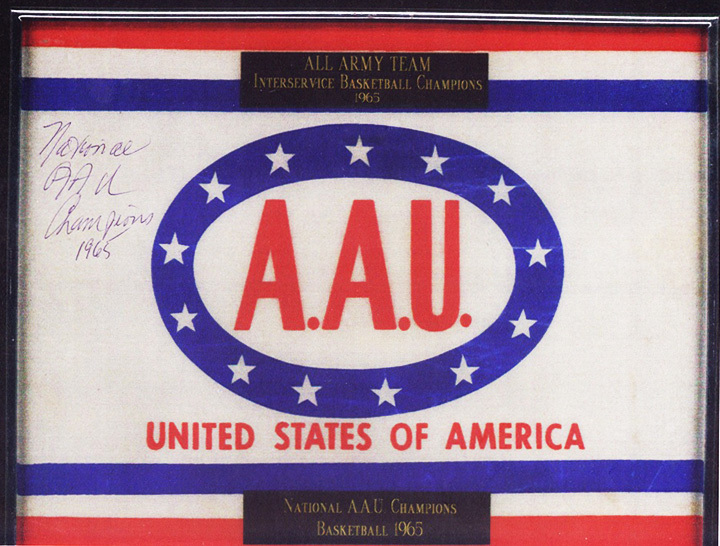 Len was able to play for the All Army basketball team. The army selected the players to play on the team. "I was in the Military Police at Fort Gordon in Georgia. One day a guy came into my classroom and asked who Len Carlson was. I said I was, and he told me I had 24 hours to pack and head to San Francisco to try out for the All Army basketball team." The team consisted of NBA professionals. In Len's second year on the team he played the 1 position (distribute the ball and orchestrate the offense) well. "Physically I was the best I ever was. I had a step and jump of 10 inches over the rim. I was hard for an opponent to handle because of my strength and jumping ability. It was probably my happiest year in basketball." 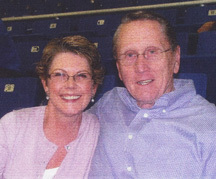 During the off season of basketball while stationed at Fort Gordon, Len was in charge of running a sports program. 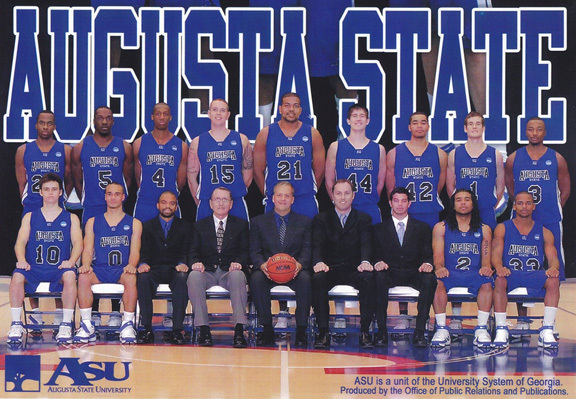 At the same time a new basketball program was starting at Augusta College, now known as Augusta State University. Len had gotten to know the Augusta coach at the gym. Len was asked if he would like to be the assistant coach at Augusta College. Len responded the same as he had two years prior when asked to coach at UConn. "I can make more money playing basketball than coaching." After Len's term in the army was over, the All Army coach helped Len get a job. 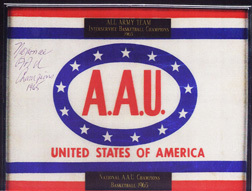 Len was soon the athletic director for all of the Armed Forces in the 8th Infantry Division in Germany. Len also had an agent that got him a job playing basketball in Antwerp, Belgium in the professional league on weekends. 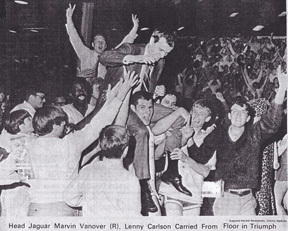 After four years and a knee injury, the coach at Augusta, Marvin Vanover, was still following Lenny's career. Len got a call from Marvin that there was an opening on the coaching staff and this time Len was interested. "I said I'd take the job, and I went from playing basketball into coaching college basketball having never coached one day of high school basketball." When Len arrived and went to the gym to watch the players he noticed there were no black players. After discussing it with Marvin, Marvin admitted he didn't know how to recruit black players, and that no teams had black players. "I said, I know how to do it. I've played on teams where I've been the only white guy. Soon we were the first school in the state of Georgia to have an integrated basketball team, and we went to three NAIA (National Association of Intercollegiate Athletic) Championship Tournaments. We had three guys drafted by the NBA. That would be like three guys getting drafted from New Haven Community College." The next hurdle was getting big players on the team. Big players are recruited by big schools. Marvin decided to start recruiting big players from Europe. Marvin asked Lenny if he would go to Europe to recruit and Lenny was soon on his way to Europe. "We became the first four year school in the State of Georgia to recruit foreign players recruiting a 7/1" player from Belgium and another from England." The school moved up from being in the NAIA to being in the NCAA Division II where they reached two National Tournaments. Lenny's next coaching move was as an assistant coach at Indiana State University where a friend of his had been promoted to head coach. The Indiana State job was a higher level than Augusta, and the school was well known. The year prior to Lenny joining the staff was the well known year that Larry Bird played for Indiana State and they lost to Michigan State where Magic Johnson played. Len's job was to recruit. Everyone wanted him to find the next Larry Bird. "There was no next Larry Bird, and if there was, he wasn't going to Indiana State (players as good as Larry go to bigger schools)." After two years Len was contacted by a friend who had been a professional player in Europe, with a lucrative job offer in a business role, not related to basketball. "I took the job. I was 41 years old, and I was a business man until I was 60." Len started as a sales representative for American Scientific Product. Later he became a key account representative. The company was bought by Baxter Scientific Products and later bought by VWR International. At age 60 Len retired, he was sick with Fibromyalgia and Polymyalgia Rheumatica where he was bed ridden for two years. As time passed Len was able to start swimming, riding a bike, lift weights and get his body back by around age 65 to where it was before getting sick. There was a new coach at Augusta State University who called Len and said he heard Len was getting his health back and wanted to know if Len was interested in coming to coach as a volunteer assistant. "I accepted and during the next three years we went to the finals in the National Championship, the semi finals, and the quarter finals, and then I left. The losses were too much to take when you get that deep into the tournament." Next for Len, the company he retired from called him, said they heard he retired from coaching, offered Len a job to come back as a consultant working from home. "I'll be 72 this summer, and I'm still working. I'm Manager of Customer Retention. In my spare time I train an NBA player, still ride a bike, swim and lift weights, not a normal life for a guy my age. I plan to retire around age 75, then I'll probably go back to Augusta State to do scouting, and individual practices with the players on the team." Len knows the UConn family of coaches well. He's known Dee Rowe since he was 14 years old when he almost went to Worcester Academy. Len and George Blaney guarded each other when Len was at UConn and George was at Holy Cross. Len's thoughts on Coach Calhoun, "I think Jim is an excellent teacher, and what I admire most about his teams over the years is that his teams are always better at the end of the year than they are at the beginning of the year which means he stays on them, and makes them get better." "As a retired coach I am always asked, if the players of my era could play with the players of today? My answer is always the same, the kids that could fly back then could play today. It's as simple as that. A basketball players fortune is in his legs." Len and his wife Debbie reside between Augusta, Georgia and Park City, Utah. They have three children Dayle, an Executive Director of Doctors for a Medical Center in Utah, Lance a National Sales Director for the Annuities Division of Metropolitan Life in Illinois, and Alex, a Head Programmer for a group of Venture Capitalists. Len and Debbie also have four grandchildren, Mallory, Slater, Brynn and Kylie. Len ended our conversation saying, "As I reflect back to when I was a youngster, basketball helped me with my self esteem. I came from a family without a lot of money and playing basketball doesn't matter if you are rich or poor. You are as good as anybody else. The second thing it taught me was how to win, and I don't mean on the basketball court. How to win in life. It comes down to discipline, having a plan, and being consistent in executing your plan, and you will achieve in life. A scholarship athlete understands the value of a college education is for more than playing ball games. It can shape your whole life if you approach it the right way. I live a life now that was unimaginable to me in my teens. I am forever grateful for the opportunity Coach Greer gave me to literally change my life, and the future course of direction. That is one of the reasons I am so generous with my time in helping youngsters. Someone reached out to me, to help me, and I do that now as much as I can."